Wow. I've been playing music since the age of 5 or as far back as I can recall. It was in third grade that I began as a drummer and to this day continue to drum. Growing up, I performed in marching band, jazz and orchestra as well as NYSMA (New York State Music Association). I was awarded medals of recognition for NYSMA for 5 years. After school, I began a few bands drumming and at times playing bass. Drums was my life...yet I always yearned to play the guitar. It wasn't until years later, I read the book The Artists Way by Julia Cameron and bought a guitar. The book taught me that there were things in life that we needed to challenge our self and find the courage to conquer. At that point I bought a guitar and dove into theory and the studies of guitar. I've been playing guitar almost 10 years now and its been the greatest joy imaginable. Its so different emotionally than drumming. More expressive and a way to speak my voice and emotions. I studied with a few great teachers but it wasn't until I studied with Rob Balducci (Favored Nations recording artist) that it opened my eyes to more than speed playing. It became about playing from the heart. I then went on to do a summer session at Berklee in Boston. At the time of my studies I was going through a very rough patch in my world and guitar saved me in many, many ways. 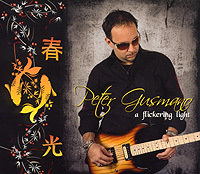 My debut guitar CD is entitled A Flickering Light and is a full length recording of all original guitar instrumental songs I wrote. All songs are published under Polar Bear Bulldog Music. This CD is a collection of songs that have a rock, blues and progressive style to it. Styles ranging from Michael Landau/Satriani to Alice in Chains. All of which elicits much emotion through melody. I began writing these tunes years ago and around the time that my mother fell ill with Lou Gehrigs Disease, more well known as ALS. I began to think that the celebration of my debut CD could also lend itself to giving back in a way that touched my mom...through the gift of music. That is how I began Guitar For a Cure. A project that gives one hundred percent of my CD sales to Project ALS in the memory of my mother, Lillian Gusmano. 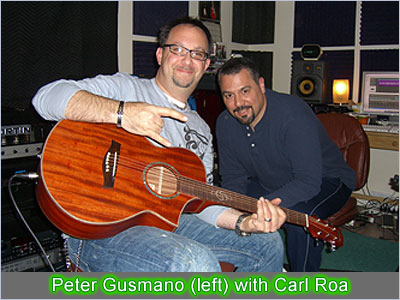 I reached out to Carl Roa (Magic Elf), Long Island native guitarist/songwriter to oversee the tracking and mix/master of the project. We tracked all guitars, bass and drums at Magic Elf Studios in Commack, Long Island. When I connected with Carl, I delivered the tracks on a drive of which I tracked many guitars here at home. What we decided is that some parts worked and some we wanted to re-track and really work the mix better. We also decided to work in Logic and focus on guitar tones. I enlisted Ethan Meixsell (bass and keyboards) and Joe Chirco (drums) to do the project with me. Ethan Meixsell, a good friend of mine turned me on to Joe who is an amazing drummer. The whole project was special in that I surrounded myself with close friends and super talented musicians. I wanted to make the project a celebration of my music and something that gave off a positive vibe. We tracked guitars for several months at Carls place using all of my gear that brought this project to life. The setting was one that lent itself to being creative and executing the parts for the tunes. Carl and Ethan were there throughout the process and all in all we had a great session bringing it to life. I also was joined by very special guest and good friend Dave Weiner (Favored Nations Artist/Steve Vai Band) on the track "Salvation." Special guests also include Carl Roa, Sal Tine and Steve Simonson. The most intense part of the project was producing the CD as I knew what I wanted the project to sound like. The mix and master process had me working closely with Carl to dial in a huge mix that made the tunes larger than life. I think we achieved that with the time we put in. To this day, when I hear the CD, Im sure it holds itself to anything I hear nowadays and Im proud of what we achieved. Even if it meant spending days on the drum mix or just the kick drum for that matter. Im most proud that everyone who has the CD chose to donate to such a special cause so close to my heart. This really makes the project even that more special as it was my music that helped my mother through the 16 month battle with ALS. I knew playing guitar was something that she loved and I know this project is one she would have loved. Well, like any other guitarist I have gear that truly moves me and makes me feel connected to my music. I will say that this project allowed me to use most all of my gear and truly apply each to the song that called for it. 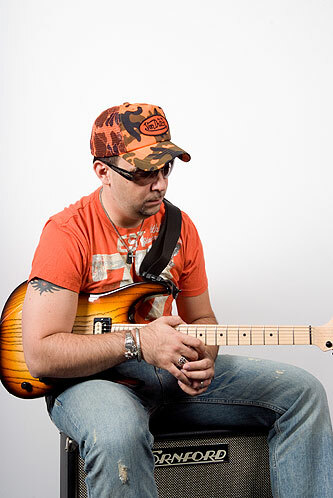 The guitars that I used for most of the project was my custom Suhr Standard which was built by John Suhr and company. A few years ago at NAMM I played Guthrie Govans Suhr and it blew me away. I also used my Bill Nash black Strat for most all the cleans on the CD. There is nothing like a Bill Nash Strat and he makes some of the finest guitars Ive ever played. 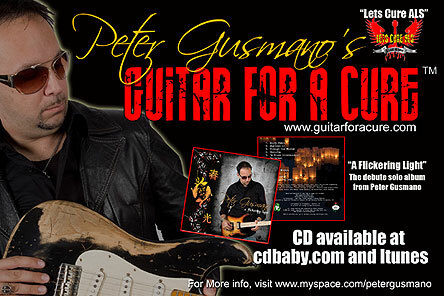 The guitar on the cover of the CD is a custom Warmoth ash body guitar that just has a special mojo about it. All of the drop tuned parts (tracks "Dispute" and "Salvation" ) were double tracked with my white Peavey Wolfgang and my Edwards Jimmy Page Les Paul. Another special guitar used for the project was a Fender Richie Kotzen Ash Telecaster made in Japan that opens the CD on the track "Sight Into Soul." I really dig Swamp Ash bodied guitars with maple necks for my solos and overdrive parts. I also use the bar quite a bit on my guitars and tend to like a Wilkenson type non-locking bridge with locking tuners. All acoustic tracks were recorded with my Ibanez acoustic and Taylor. 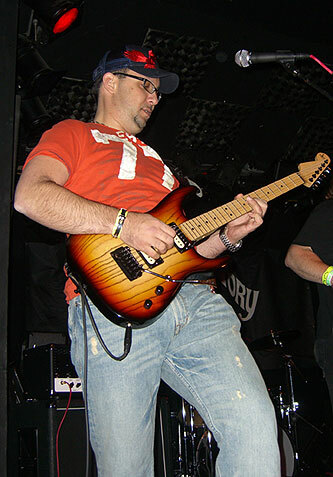 I use Dimarzio pickups with the exception of a few guitars with custom Seymour Duncan's. 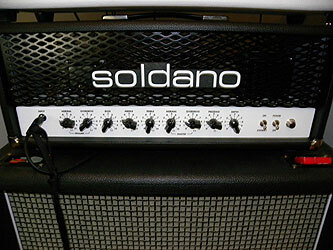 As far as amps, the CD is tracked about eighty percent with my Soldano Hot Rod 50+ for crunchy tones. What can you say about this amp?....its simply the holy grail of tone. I was fortunate to have James Burke of Blues City Music who helped me dial in the tone I was looking for. It has the ability to get amazing high gain yet also that slightly dirty clean channel that works amazing for blues type parts. Recently, Soldano and his team sent me some kind words on my project and I am happy to be listed as a Soldano user on their site. I mean, with the list of users of Soldano, what can be bad! I also used my Cornford Carerra on parts of the project and a Fortin modded Marshall. We used a Cornford 4x12 with Celestion Vintage 30's as well. As far as pedals, I used a Morley Tremonti Wah, Digitech Whammy Pedal, Keeley Modded BD-2, BBE Soul Vibe, MXR EVH Phase 90 and Flanger, Xotic Scott Henderson RC Booster and BB Preamp as well as TC Nova Delay and Vox Satriani Time Machine Delay. I also used a Fernandes Sustainer on a few tracks that really brought some lines to life. I really love working with unique pedals to make certain lines stand out within a song. I feel the point of them is not to overuse them but take the time to think about what works. All my guitars have Dean Markley Blue Steel Custom Lights 9-46 gauge strings. I use Jazz style In Tune Guitar Picks and Mogami Cables. While everyone can have awesome guitars, there is nothing more important about how they play. Sal Tine of The Guitar Fix (www.theguitarfix.com) is a dear friend of mine who also happens to be the most talented and amazing tech here on Long Island or anywhere. Whether its a setup, pickup rewire, custom inlay or anything else centered around my guitar, I only trust Sal to make the guitars play like a fine tuned Ferrari. I often wonder how a guitar can play better...and the answer is to let Sal work on it. He knows the way to make your guitar play better and without him, Id be lost. Everyone needs to visit The Guitar Fix. Plus Sal will just blow your mind as a player and a great guy. 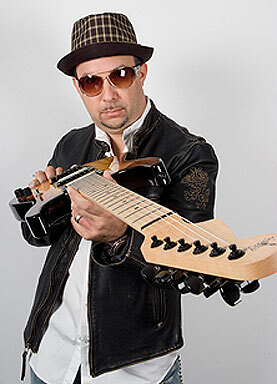 Some of my favorite players are Eddie Van Halen, Stevie Ray Vaughn, Joe Satriani, Michael Landau, Steve Lukather, Richie Kotzen, Joe Bonamassa Warren Haynes, Guthrie Govan, John Sykes, Brad Paisley, Jimmy Page, John Mayer, Paul Gilbert and BB King. For me, there are too many to mention but I love all styles of guitar and lately Ive been listening to some amazing country players. Yes, country and boy can these guys blow me away in a different way. Im a rock lover in every way but to me, there is nothing I love more than a ripping blues jam. It just has no boundaries and allows you as a guitarist to speak your emotions though your guitar. I also enjoy jamming with my friends most as they are players that I admire in so many ways. Ethan Meixsell, who played bass on my CD, is simply a mind blowing guitarist and I definitely suggest everyone check out his debut CD Pathos and Logos. Same with Carl Roa and his projects. Right now, I have 5 new tunes in the works. I made some major investments in my home studio and will be tracking all my guitars here. I am using an API A2D preamp and I have all my amps miked up to use. The new material is sounding amazing and I am thrilled with the tones we are getting. I am letting the writing process take its natural process and the songs are evolving. Some tunes I am working on are ideas that were not fully formed for the first CD. Rather than rush the idea, I wanted to grow it. I am also using some different tunings on my guitars with the new tracks which alters the way I approach writing. My plan is to have another CD of new material within a year or so. I can never repeat myself so I want to continue to grow as an artist on the new project...which I feel is the case with the direction of the new arrangements. Some of the tracks have a heavier prog-style to them also. On a personal note, my wife and I are expecting our first child shortly so I want to take this time to enjoy this blessed time in our lives. I do know that my writing energies are stronger than ever. I am always performing with a few cover projects of mine in the area. 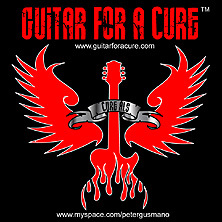 I also plan to bring Guitar For A Cure (tm) to life in 2010. Not only with performances of my original music but to spread the work on how music can heal in many ways. Bill Nash of Nash guitars has built a one of a kind Strat signed by Metallica, Cheap Trick, Def Leppard, Carl Verheyen, Bad Company, Poison, Buckcherry and so many more. The auction of this one of a kind guitar will see 100% of the profits going to Project ALS. To date I have raised almost $10,000 for the charity and was the top independent fund raiser for Project ALS. My brain is never at rest on how to make this project help people understand music and the healing ability. There is a lot more music and a lot more of my spirit to come. Peace. You can also visit my blog on the web site for updated info. 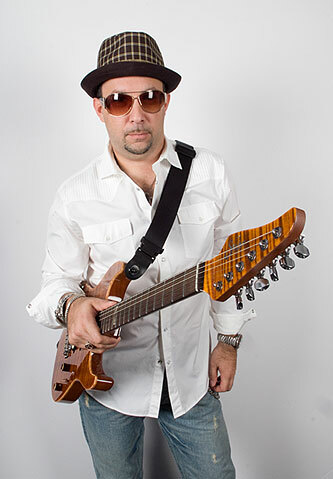 Also Facebook...and be sure to visit my site for info on how to win the one of a kind Bill Nash Strat. Keep Rocking!